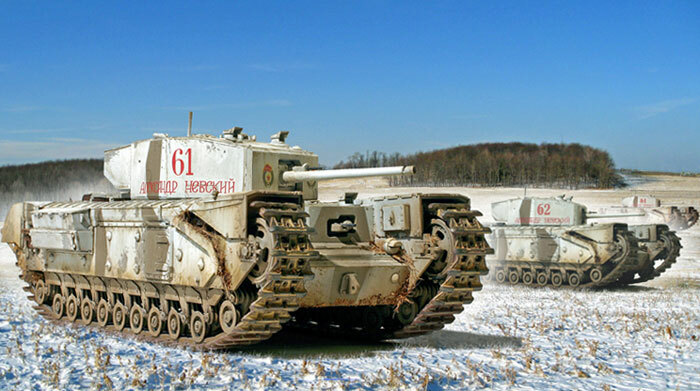 The new Churchill Mk. III is part of the recent renaissance in British World War II AFVs and a welcome addition to the Allied stable. 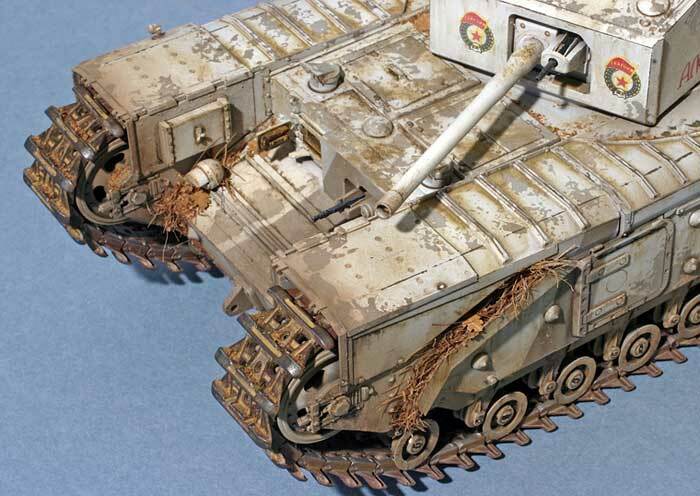 In contrast to the old Tamiya kit which represented a late war version, the new AFV Club kit presents a version that can be painted in a much wider range of schemes and markings. After looking over the kit, I recognized that it was going to be mostly "out-of-the-box" so I decided to concentrate on the finish. 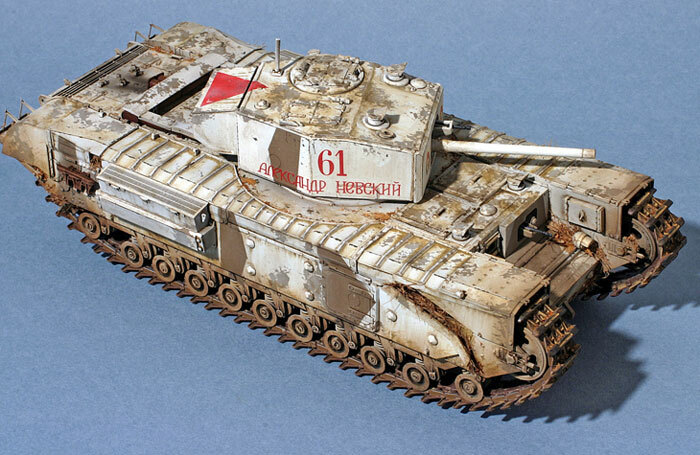 I chose one of the kit markings, that of a Lend-Lease Soviet Churchill of the 50th Separate Breakthrough Tank Regiment in a winter scheme that would be ideal for showing some seriously distressed paint. I started with the suspension which was a challenege due to the many parts as well as AFV Club's dubious decision to articulate the suspension with working springs. This makes the suspension a bit of a mousetrap and complicates the whole process. Nevertheless, the detail is gorgeous. Once the suspension was done, I found that most of the rest of the assembly was very straight-forward with very few glitches. I decided to replace the grating on the rear with some scratchbuilt louvers, and I replaced the side gratings with some HO scale model railroad PE that happened to be a close match. I suspect we will see this in after-market photo-etch. The color scheme is white-wash over SCC 2. I mixed up some SCC 2 using Tamiya paints and based on the colour chips in Mike Starmer's booklet. Once dry, I applied a barrier layer using Testors lacquer gloss as I planned to use the "tooth-paste" method of masking. I masked the geometric bands using Tamiya tape, and then applied Crest tooth-paste in irregular patches using a small damp sponge. This is a variation of the "salt-mask" technique. After air-brushing the model with some Tamiya white, I waited until it was dry to the touch, and then brought the model over to the sink. I then carefully scrubbed off the paint that had been masked with the tooth-paste. Once this was done, I added the kit decals and proceeded ith some intensive weathering using a variety of washes, dry-brushing, scraping and other effects to give the vehicle a well-worn look. The red triangle air identification marking is not based on any specific information, but I wanted to brighten up the finish and this type of marking was fairly common-place. I got a set of the after-market AFV Club hard plastic tracks from Cookie Sewell, as these have much sharper detail than the kit's basic vinyl track. 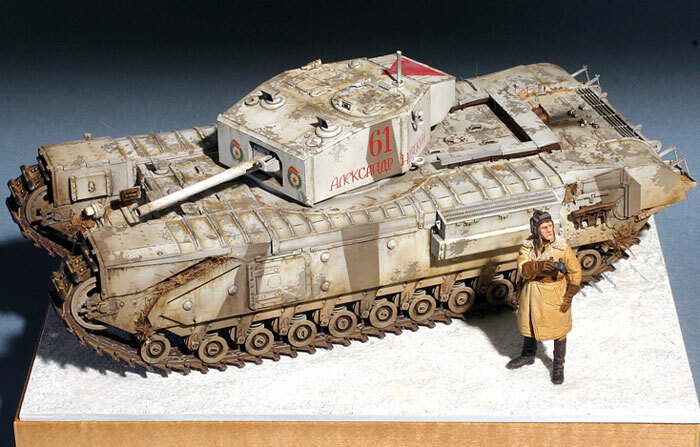 The tank crewman is from Alexander Miniatures with an appropriate sheepskin coat. Overall, I was extremely impressed with this kit. This was one of the best kits I have built over the past few years both in terms of detail and design, and a lot of fun to build. I certainly hope that AFV Club (or the aftermarket folks) with grace us with some more variants.